Pulmonary function test commonly known as PFT is a respiratory test for detecting lung capacity and lung wall mechanics for diagnosis of the chest problem. Pulmonary functions tests are a branch of tests which can help your pulmonologist to measure your lungs functions to determine if you have any lung disease like asthma or COPD. It also helps your pulmonologist to find out how well your medicine is working. Pulmonary function tests will assist pulmonologists to diagnose and treat all pulmonary diseases including but not limited to asthma, allergy, lung fibrosis, lung cancer, sarcoid, and chronic bronchitis. A Spirometry is a test for diagnosis and monitors certain lung conditions by measuring how much air you inhale, how much you exhale and how quickly you exhale. 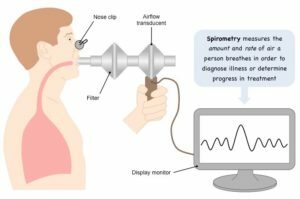 Spirometry is used to detect the following disease. Spirometry may also use to measure how well your medication is working and if your breathing problem is under control. Spirometry may be used before a surgery to check if lung function is adequate for the hardship of an operation.